Got notice of 1 day only bonus cash back on the Ebates App. What caught my eye is the 10% cash back from The Bay, which is hot. 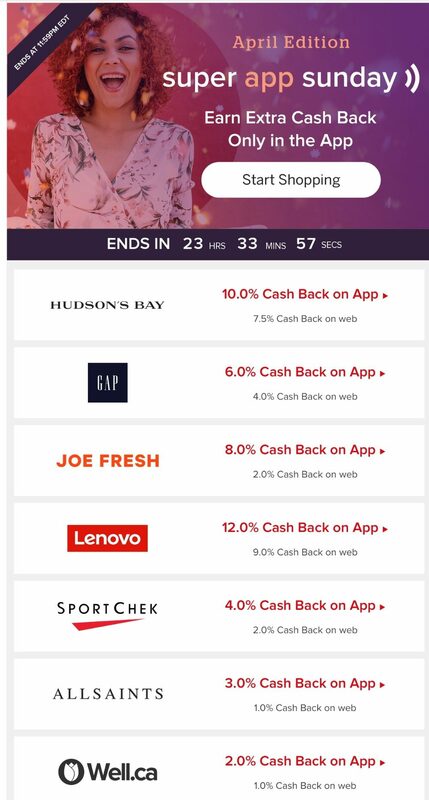 You may also be interested in 12% from Lenovo or 8% from Joe Fresh. Check the app for the full list of stores that qualify for extra cash back. anything worth buying from the bay other than clothing? Good question.. For me, it's more for my wife, as she shops online alot and the bay is one of those stores. She mostly buys clothes and cosmetics, but right now there is a big sale on handbags and she bought a coach bag, which she claims is an amazing deal?? She doesn't go through ebates all the time even though I keep reminding her.. I guess for the guys, there may not be much, but I'm trying to save you money if you got a wife or girlfriend that shops at the bay lol. GL. 550-10%= 495. Isn't this a pretty good deal? Do keep in mind that the 10% cash back is on pre-tax cost and you're paying tax on the full amount, therefore it is technically not a full 10% off as you've stated. It's not the same as a 10% discount. Still good value, so long as that is understood. Thanks OP. Was going to get 3x NEST Protects (Batt.) but they only have 1 in stock. Picked up a Global knife instead that was on sale for 70$. Eek just ordered a stroller yesterday with the 7.5% cash back. Delivery is tomorrow so I guess it's not worth cancelling returning and reordering for $10. I think baby items where sales are strictly controlled by the manufacturers in Canada are good to get. anyone know how to stack the $10 off $50 coupon code you get from texting "SAVE" to 22322? That coupon is for in store use but is there any way to get ebates applied on in store purchases or vice versa? No stacking with "Text 'n' Save"
Only current active promo code is VIP - until Tuesday Rewards VIP members can save an extra 10% off Cosmetics & Fragrances and up to 25% off select regulat price designer apparel, footwear' accessories and watches. I was looking at cookware sets...it's like trying to buy luggage. The 70% off sale price turns out to be the regular price. What a racket to muddle through. Anyone go through this process and have any recommendations?